On December 4, in the frame of the core course “Bildung: Education and Formation” led by Prof. Dr. Matthias Hurst, Bard College Berlin welcomed alumnus Florian Hoffmann, the Founder and President of the DO School, for a talk on “21st Century Skills and the Future of Higher Education.” Florian is one of the old “veterans”– an Academy Year (and later Project Year) student in one of the first generations of graduates. He is one of the people who witnessed how the college was taking shape, and still remembers the days when students, with great enthusiasm and joy, helped set up the classrooms by moving furniture, patiently eating tons of pizza before the Cafeteria was established – whilst enjoying a number of enlightening and educational early guest lectures that took place on campus. Florian says he would describe our college as “a small liberal arts education institution in the beautiful city of Berlin, offering courses in humanities.” As a social entrepreneur and innovator in the field of higher education, he is greatly engaged in helping liberal arts students actualize their greatest potential that the liberal arts education helps increase. 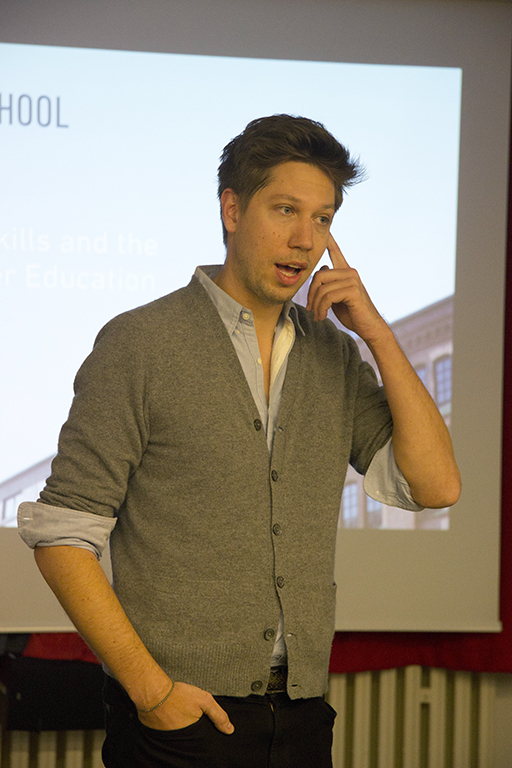 On our campus, Florian Hoffmann talked about the dynamics of the modern Western university system and how the DO School – a globally engaged social enterprise that educates, trains and mentors talented post-graduate individuals to transform their ideas into action – fits within the transitional period between college and professional occupation/post-graduate studies. He is a man of action, with a strong emphasis on doing, regularly engaging himself by contributing to the public debate on higher education and innovation. He has taught the DO School method at a variety of universities including Columbia University, Oxford University, and the Hasso Plattner Institute at Potsdam University. Florian’s talk was far from a regular lecture – he started by asking all the guests to join him for a conversation, first by moving to the first rows of the lecture hall, then by engaging in dialogue with their personal stories and experiences throughout the event. Such an approach largely helped students, professors and off-campus guests alike to stay fully tuned to his interactive presentation – enticing them to ask a number of questions at any given time. According to Florian, that kind of educational environment is exactly one of the things specific to the DO School – by engaging in conversation, the students remain physically and mentally aware of what they themselves and other people in the room are saying. The motto of the DO School, “learn to get started by doing,” only scratches the surface of what the idea behind this entrepreneurial project is. When talking about the conditions of the 21st century higher education, Florian mentioned something that I found absolutely striking: only 1,5% of the world’s university students has access to the kind of (liberal arts) education that Bard College Berlin students have! Of course, we all have it in the back of our minds that private education is, in the worldly context, mainly for the privileged few – and not just financially, but also intellectually. To enroll at a liberal arts institution, one already has to have a certain educational and experiential background that will allow for the maximum utility of the teaching methods employed at liberal arts schools. However, when confronted with the actual percentage of our privilege, especially in comparison to the other young people on the globe, it becomes all the more evident that with such privilege of being educated as the “world’s leaders, entrepreneurs, innovators, and scholars,” we also have a certain responsibility to ourselves, as well as our society, to maximally use the opportunities offered to us. The DO School helps young entrepreneurial graduates do just that – by giving them a push from the academic environment to becoming social entrepreneurs in the practical sense. With the launch of the DO School and a number of successfully completed projects, Florian seems to have empirically proven that learning for life happens best by doing – in life. With a retention rate of 85%, the DO School has equipped a number of young people from around the world with the necessary skills to imagine, produce, and bring their ideas to life. The method for the whole process is rather simple: the DO School receives challenges from various companies (i.e. H&M, GIZ, Echoing Green, Nike, the Dekeyser & Friends Foundation, among many others) to come up with sustainable, innovative and creative solutions to their company’s practical problems – ranging from ecological to infrastructural difficulties in their businesses. The DO School then announces a vacancy; young innovative and creative people interested in accepting the challenge and willing to work in groups to come up with sustainable and effective solutions to these problems are invited to apply. It is a perfect economic model as well: the students get practical knowledge in finding creative solutions by being innovative and working together for free, while the companies solve some of their issues and support the future by financing these young people. In the light of the DO School method and its entrepreneurial benefits, the only thing I would like to add – for all of us, liberal students, to remember – is Florian’s reflection on “what makes a good leader.” He says that “a leader is someone who acts in accordance with his/her passions and creates positive value for others.” However, the two golden skills that make a leader/innovator successful are “(1) managing risks, and (2) dealing with failure successfully.” My wish to all of us is to remember this advice, get out there, be daring, fail and stand up again – as many times as necessary – and help shape our world into a better and a more sustainable one. Or, in other words, do our liberal arts education in life, as in university!